A scenario analysis is a research topic dedicated to support policy planning. The objective is to assess an impact of key parameters or events on the behaviour of strongly dynamic system such as a fleet of power plants operating within a fuel cycle and give a feedback information which is constrained by the initial assumptions and boundary conditions. Nuclear scenario analysis can be carried out in IKET by means of COSI6 code, SOLEQ code, NFCSim code and webKORIGEN code. Each software tool has its peculiar applicability range. All of them, however require neutronic data libraries specific to the reactor design under consideration. A new challenge is to consider the transition to innovative fast reactor systems (breeding or burning) with associated closed fuel cycle employing partitioning and transmutation strategy. The principal difficulty is connected with a technical readiness of new technologies and the overall costs. Thus one country in isolation can hardly undertake such development. The most promising option is the concept of internationalization of such fuel cycle both: at a regional (Europe) or a global (World) level. Scenario analyses committed to international fuel cycles have a huge benefit indicating possible management problems. 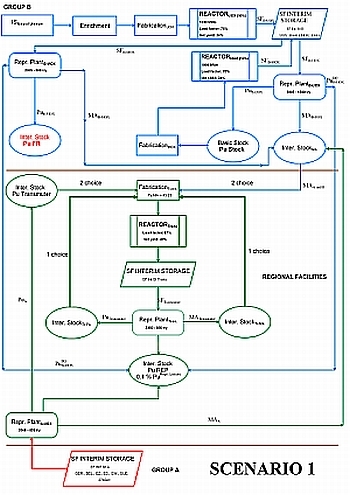 Management of Uranium resource and the waste disposal can be analyzed by showing the impact of different strategies on the geological repositories. The analyses is supplemented by economical and proliferation risk investigations which address policy makers and pertain to the public acceptance. IKET activities have a consulting nature and supply the national and international organizations such as NEA/OECD or EURATOM with our expertise. In the	PATEROS Project (6th European Framework Programme - PArtitioning and Transmutation European ROadmap for Sustainable nuclear energy - the benefits of regional deployment transmutation facility with international P&T fuel cycle were assessed. A dedicated fleet of advanced ADS-EFIT (Accelerator Driven System – European Facility for Industrial Transmutation) facilities was simulated. The primary objective was to reduce the MAs legacy to a minimal level within a common effort of countries, among them nations phasing out nuclear energy or in contrary with an ongoing nuclear development. On mandate of NEA (Nuclear Energy Agency) /OECD we contribute to the activities of an expert group working on the global world transition scenario towards fast reactors. Scenario investigations are performed assuming homogeneous and heterogeneous world treatment, the latter with subdivision into four macro-regions according to IPCC proposal. World resources, fuel cycle infrastructure and required capacities needed to assure sustainable power plant supply, effective waste reduction and management, repository issues etc. are studied identifying possible critical points and proposing effective solutions. Apart from this some innovative systems such as fusion-fission hybrid systems are analyzed in order to compare the performances of different fast reactor types: subcritical with accelerator or fusion driven source, and critical burners. The key issue is the waste burning capability.